ABOVE PHOTO: 1933, 1950 and 2012. The tree is a Lime and has only got fatter over the last 70 odd years. The longer we are here the more pieces of the jigsaw are presented to us. 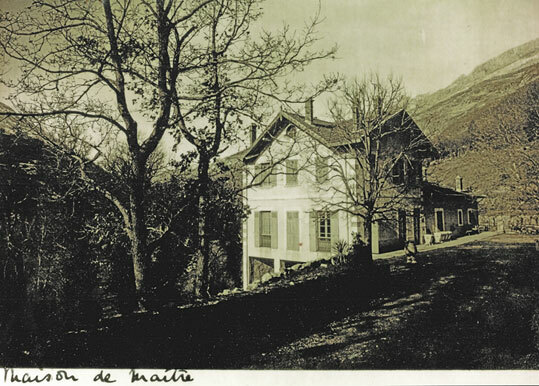 In brief, we understand Le Foulon to have been constructed towards the end of the 19th century as the Maison d' Maitre to the Domaine du Foulon - a large estate that owned most of the surrounding valley and mountain. In 1939 it was converted to a hotel and restaurant, but the grand opening was put on hold because of a little man with a funny moustache from Germany. So it wasn't until after the war that Le Foulon as we know it got off the ground. With some tables and chairs this picture could be mocked up tomorrow - nothing has physically changed for years. Going back to the early days it never made sense to us that a grand house on such a scale could have been financed by some simple mountain farming. After all, there is little or no farming here today - the death knell came when a blight wiped out all the crops way back when. However, one definition of the name "Le Foulon" is a place where they 'fulled the cloth' - one of the first textile industries that primarily used water power in the form of a mill to process rough old cloth into something more saleable. 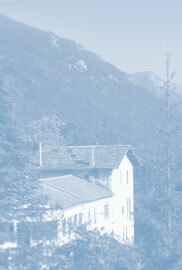 The Domaine had a mill about a kilometre down river from us, which was undoubtedly part of the original Domaine. So perhaps this unique property was built from the generous proceeds of an early textile industry? 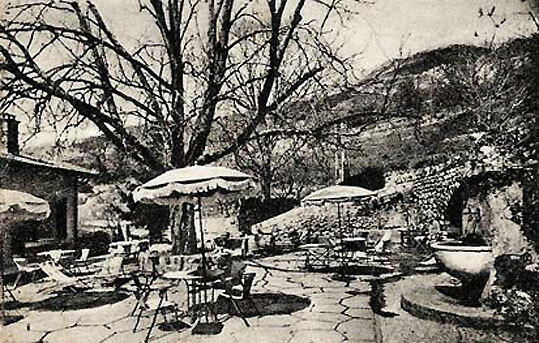 In between the wars we have learnt that the Domaine was owned by a Spaniard called Fablo Fernando - nothing more is known of his stewardship, other than he sold it to a woman from New York called Gertrude Hinternesch, who had married a Frenchman, but not a local, and who was rarely to be seen here. It's probably safe to assume they weren't keen farmers and that Le Foulon was some kind of retreat or second home. Next up was Monsieur Almairac, the man with the vision of converting Le Foulon into a hotel and restaurant. We know from an aerial photograph taken in the 1930's that the trout farm already existed - for how long is anyone's guess, but presumably Monsieur Almairac realised the profit to be made from taking a trout direct from the farm to a linen covered table. 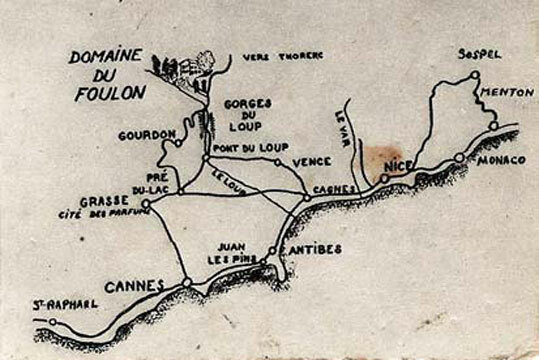 Even in the fifties the owner was aware of what a rare location Le Foulon enjoys. No doubt buoyed by the incredible success of Pont du Loup through the gorge, he had visions of wealthy Victorians as well as locals enjoying the mountain air and some healthy fresh food. The fact the Germans blew up the railway viaduct that brought these tourists to the gorge must have been something of a quite literal blow. Pont du Loup has never quite recovered despite the success of a tourist inspired sweet factory. We recently had a lady from Cannes arrive who hadn't been here since 1943. She knew Monsieur Almairac and had stayed here for a short while. She talked of cattle and veal calves and said the mill was long since out of action even then. She has a film of her stay, and if it's possible to get hold of it and digitised then we'll post it on the site. 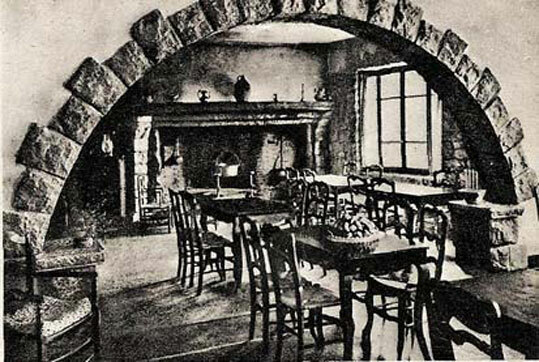 Anyway, Monsieur Almairac built a very successful restaurant and hotel, with Le Foulon being renowned throughout the Cote d'Azur as the only place to be when in the mountains. Fresh trout adorned the plates as did Crayfish from it's own farm. Rich and famous ate here, and business boomed. It was also a popular spot for various Mr and Mrs Smiths, paying cash, for a discreet night in a double room. Monsieur Almairac decided to retire and Le Foulon was handed over to a Monsieur Soubrier during the late seventies. A lack of investment in an aging building soon had Le Foulon fraying around the edges, no doubt reflected in the number of visitors. Without the necessary work Le Foulon went into decline, and once the roof started to leak it must have gone down hill rather rapidly. 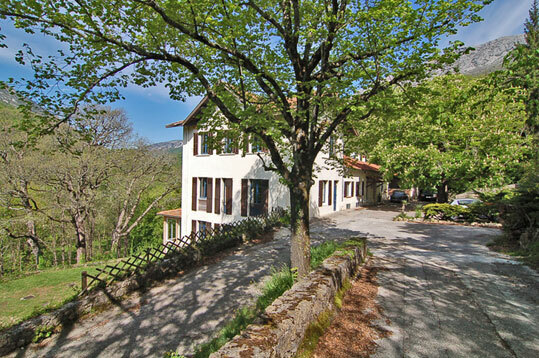 The owner borrowed money from a local called Monsieur Maurel, from an old and influential family in Greolieres. The loan was secured against the property, and for whatever reason it was defaulted on and the building changed hands rather acrimoniously. Even more so as Monsieur Maurel had also won over Monsieur Soubriers wife. So, in the early nineties, a wealthy octogenarian from Greolieres, with a new mistress, finds himself the owner of a large and dilapidated hotel and restaurant. Uninterested it is left to rot. Shortly after he dies, and with complex succession laws Le Foulon stands empty and unloved until 2003. During this time the sharp thinking grandson of old Monsieur Maurel gambles that the building will be his once the court room dust has settled and invests in a new roof for Le Foulon. This piece of keen thinking probably saved the building from crumbling beyond repair and it paid off - in August 2003, after being on the market for just 2 weeks, we made an offer to Monsieur Maurel Junior and his Mother for the purchase of this amazing piece of Provencal history. Much haggling and begging at the bank saw us in by January 2004 and the lengthy and costly renovation soon began. The rest, as they say, is history. The courtyard, fountain and horse chestnut survive relatively unchanged.